Chad, in Central Africa, is bordered by Libya to the north, Sudan to the east, the Central African Republic to the south, Cameroon and Nigeria to the southwest and Niger to the west. Part of France until 1960, it endured three decades of civil warfare, as well as invasions by Libya. Chad remains plagued by political violence. Since 2003, the Darfur crisis in Sudan has crossed over the border, destabilising the nation, driving hundreds of thousands of Sudanese refugees in and around camps in eastern Chad. Today Chad is classified as one of the poorest and most corrupt countries in the world. Literacy (definition: age 15 and over can read and write French or Arabic) – 35.4% of total population. A project by former Woodbury University (USA) student, Arturo Nesterenko (led by Faculty Project Leader Jeanine Centouri) addresses the issue of education for Darfurian children living as refugees in the city of Abeché. Entitled ‘BAATT Project: Building as a Teaching Tool’ the aim of the project is also one of educating architecture sudents and local residents by hands on experience of building. Students enrolled in the BAATT program participate in building teams to erect portions of the structure. The project began with a study of available material and human resources. 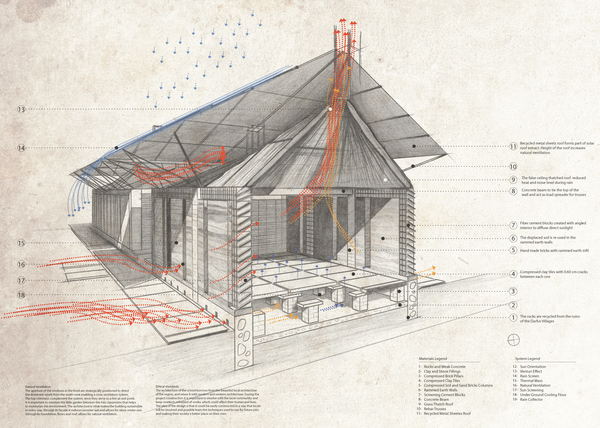 The materials were selected following an examination of local building practices of Sub-Saharan Africa. This includes compressed mud bricks, rammed earth, thatch roofing, recycled metals, and minimal amounts of concrete, and steel work. 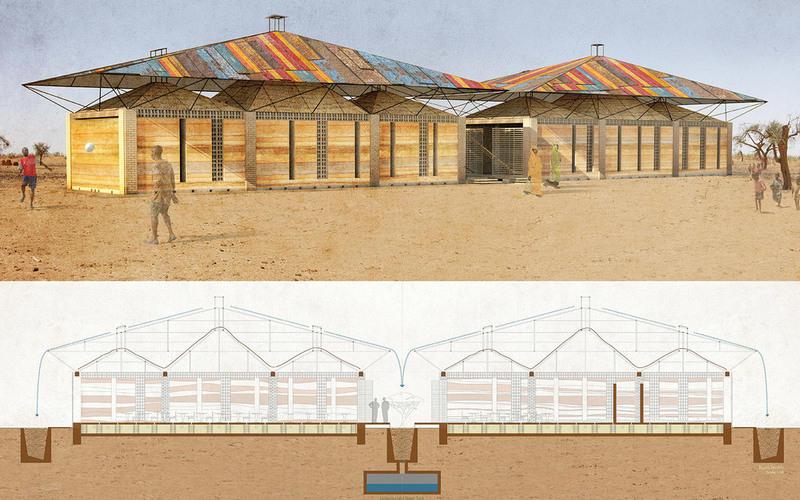 The design development alternated between full scale materials testing, scale models and drawings, complemented by a pictorial manual for communicating the design and techniques to the local population on the ground in Chad. 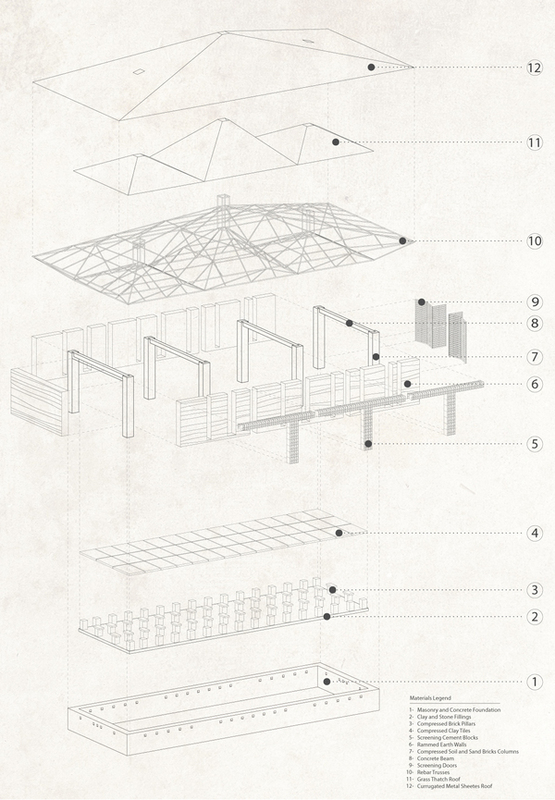 The building combines local building practices with contemporary sustainable principles. 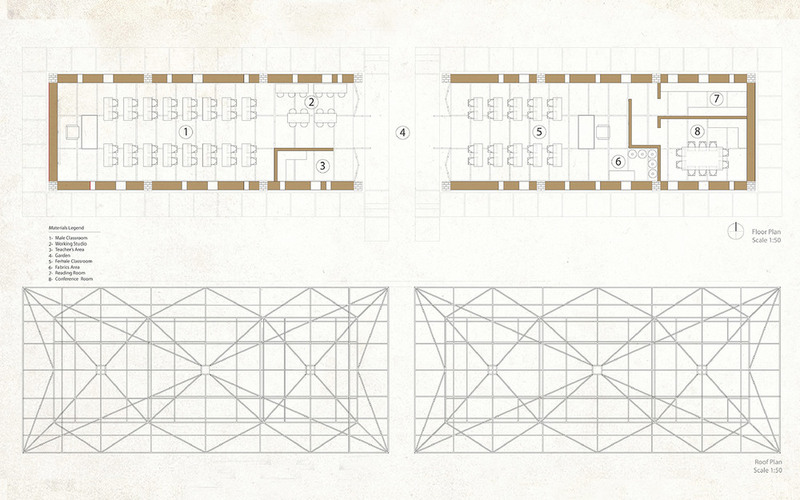 The rectangular open floor plan is designed to accommodate approximately 80 students (40 male and 40 female students). The thatched pyramidal roof structures is covered with a second reclaimed metal roof canopy which shades and protects the interior from the intense heat. The main structure is made of compressed mud bricks using a hand operated compression machine. A minimal amount of concrete and steel are employed. The infill walls between the columns are non-structural rammed earth that is made of soil, and a small amount of cement. 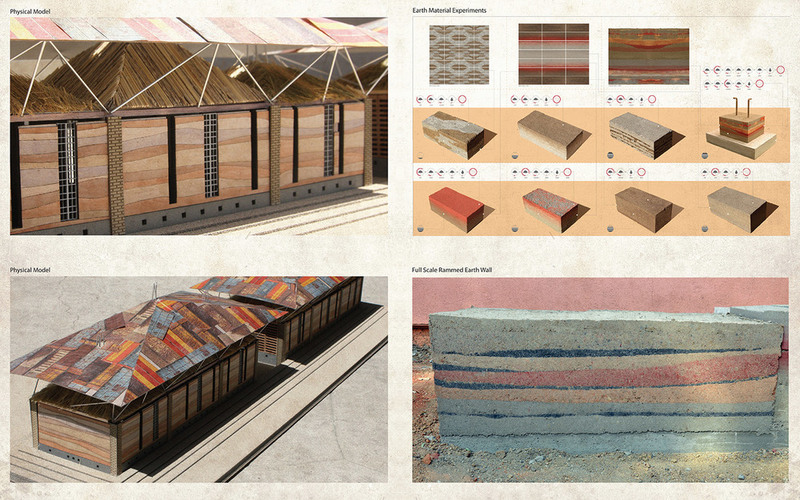 These walls are ventilated with fiber cement cylindrical tiles that may be made by the students on the site. “This single volume building is designed as one classroom space, and is intended to accommodate one gender. It is anticipated that two volumes will be built, along with smaller open-air canopies that serve as shade devices, lunch areas, and prayer spaces. 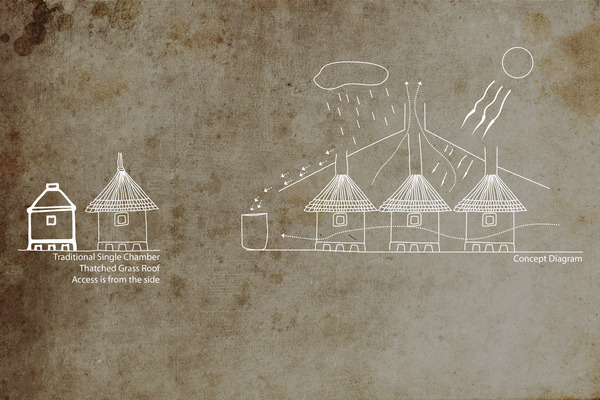 Additionally, composting toilet structures will be built on the site.